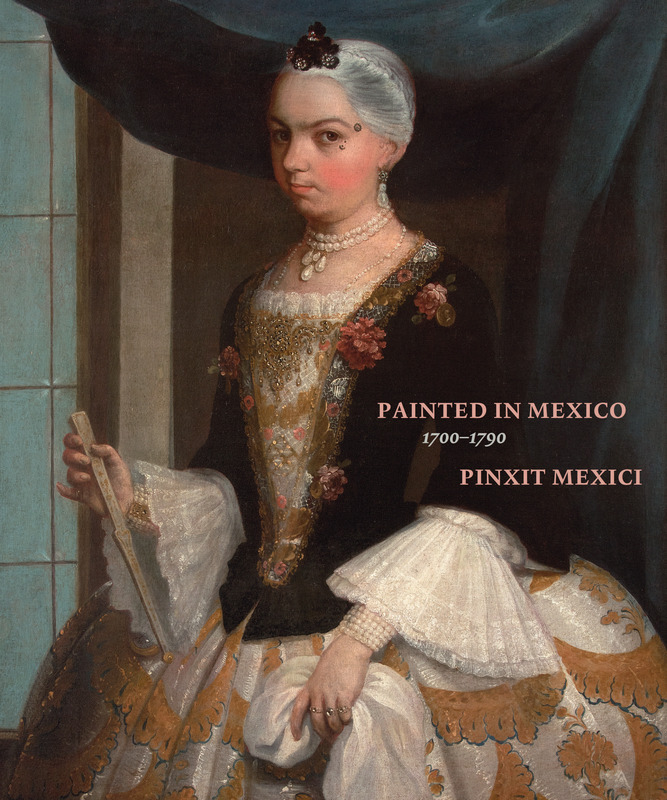 The vitality and inventiveness of artists in 18th-century New Spain (Mexico) is the focus of the exhibition Painted in Mexico, 1700–1790: Pinxit Mexici, opening April 24 at The Metropolitan Museum of Art. Through some 112 works of art (primarily paintings), many of which are unpublished and newly restored, the exhibition will survey the most important artists and stylistic developments of the period and highlight the emergence of new pictorial genres and subjects. Painted in Mexico, 1700–1790 is the first major exhibition devoted to this neglected topic. The exhibition is co-organized by the Los Angeles County Museum of Art and Fomento Cultural Banamex. During the first century after the conquest of Mexico, artists from Europe—mainly immigrants from Spain—met the growing demand for images of all types, both religious and secular. Some of these artists established family workshops in Mexico that endured for generations. By the middle of the 17th century, artists born and trained in Mexico, responding to the mounting needs of both individual and institutional patrons, had risen to prominence and developed pictorial styles that reflected the changing cultural climate. The 18th century ushered in a period of artistic splendor, as local schools of painting were consolidated, new iconographies were invented, and artists began to organize themselves into academies. Attesting to the artists' extraordinary versatility, painters whose monumental works cover the walls of chapels, sacristies, choirs, and university halls were often the same ones who produced portraits, casta paintings (depictions of racially mixed families), folding screens, and intimate devotional images. The volume of work produced by the four generations of Mexican painters that spanned the 18th century is nearly unmatched elsewhere in the vast Hispanic world. The growing professional self-awareness of artists during the period led many educated painters not only to sign their works to emphasize their authorship but also to make explicit reference to Mexico as their place of origin through the Latin phrase pinxit Mexici (painted in Mexico). This expression eloquently encapsulates the painters' pride in their own tradition and their connection to larger, transatlantic trends. Great Masters introduces the works of leading painters around whom others congregated, emphasizing intergenerational ties and the steady coalescence of a local tradition. It highlights the role of Juan Rodríguez Juárez in stimulating a stylistic change and spurring the establishment of an independent painting academy around 1722. Through an academic approach based on copying and drawing—aided by the arrival of prints and paintings from Europe—these artists and their contemporaries perfected their compositional skills, refined their depiction of space and architecture, and paid increasing attention to the anatomical correctness of figures. Master Storytellers and the Art of Expression considers the resurgence of narrative painting in 18th-century Mexico in response to a growing demand for images that could convey complex sacred stories from the Bible and the lives of the saints. Often conceived as series, these works decorated the interiors of churches, convents, colleges, and other public spaces. An emphasis on domestic interiors and everyday details served to establish a connection with the viewer and humanize sacred content. Noble Pursuits and the Academy explores the efforts of artists throughout the period to reform the practice of painting and challenge entrenched social and professional hierarchies. Asserting that painting was a noble rather than a mechanical art, painters wrote and referenced art treatises, equated their task with that of the supreme creator, and refashioned their own image through self-portraits and other works that showed their mastery of geometry, mathematics, and architecture. Paintings of the Land assembles a compelling group of depictions of local peoples, traditions, and places. The expression "paintings of the land" (pinturas de la tierra) is used in contemporaneous writings to describe works unique to Mexico—either made there or representing local subjects. These include vedute (cityscapes or vistas), casta paintings that show racially mixed families, folding screens with fêtes galantes (amorous figures in rustic settings), and depictions of Indian weddings, all of which are punctuated with colorful local elements. These works brilliantly exemplify how Mexican paintings of this time fulfilled artistic, political, and documentary purposes simultaneously. The Power of Portraiture associates the upsurge in portraiture with the economic growth of the viceroyalty, as members of different social groups—particularly within urban contexts—commissioned artists to paint their likenesses. 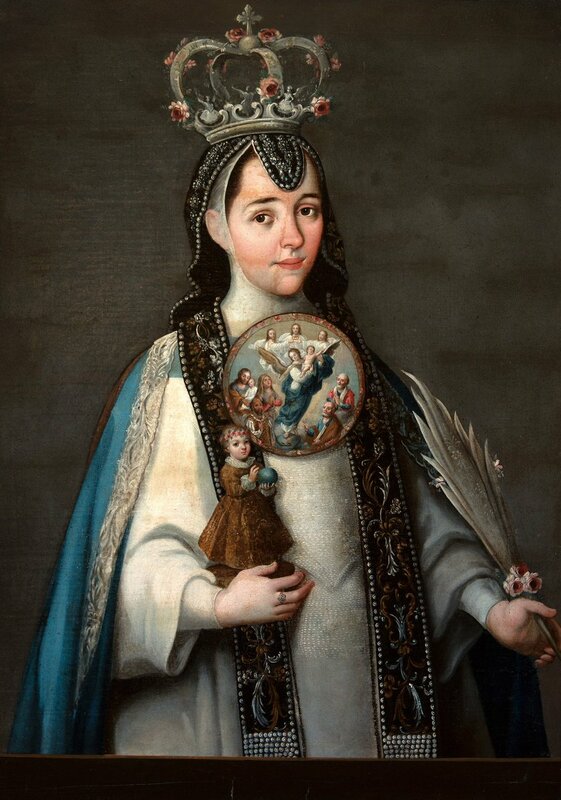 In a hierarchical society such as New Spain, which placed a premium on nobility of birth, piety, wealth, titles, and merits, portraiture had the capacity to convey both individual and collective likenesses. Portraits enabled people to fashion and refashion their identities and project them onto society and to memorialize families and document institutions, both religious and secular. The Allegorical World looks at a fascinating, highly inventive type of painting often commissioned by religious orders to convey abstract theological concepts or instruct in matters of faith. These images became particularly popular in part because allegory can express many things simultaneously. Allegorical paintings can be broadly divided into four categories: guides to inner spirituality, teaching or mnemonic aids, symbols that promoted local devotions, and commentaries that extolled (or criticized) figures of power. Some allegories were conceived as large-scale paintings for the adornment of architectural spaces, while many smaller ones were intended to awaken individual devotion in private oratories or monastic cells. Imagining the Sacred features a selection of painted replicas of miracle-working cult images. These paintings, which represent dressed sculptures, belong to a long tradition in which many of the best artists of the day participated. Often depicted in the setting where they were venerated, the sacred images are seen on altars adorned with curtains, candles, vases, and flowers. Individual devotion was commonly aided by smaller images, often painted on copper with great skill and precision. The technical refinement and exquisite detail of such works stimulated both aesthetic and religious contemplation. This final section of the exhibition will include seven paintings from The Met collection, all of them acquired since 2014. The exhibition is curated by Ilona Katzew (Los Angeles County Museum of Art), with guest co-curators Jaime Cuadriello (Universidad Nacional Autónoma de México, Mexico City), Paula Mues Orts (Escuela Nacional de Conservación, Restauración y Museografía, Mexico City), and Luisa Elena Alcalá (Universidad Autónoma de Madrid). At The Met, the exhibition is organized by Ronda Kasl, Curator, The American Wing. Edited by Dr. Katzew, with contributions by Dr. Alcalá, Dr. Cuadriello, Dr. Mues Orts, and Dr. Kasl.